My own definition of interaction or what it means to be interactive is the relationship between two beings, not necessarily living. When two or more objects are actively communicating with each other in some sort of way, I consider this to be “interaction.” As well, when a single being or object is trying to reach a certain goal with another being or object, it is interacting with it in order to reach this goal. By physically moving, speaking, or communicating with one another, humans interact. With machines, if programmed to move or speak with another machine or human, they also interact. 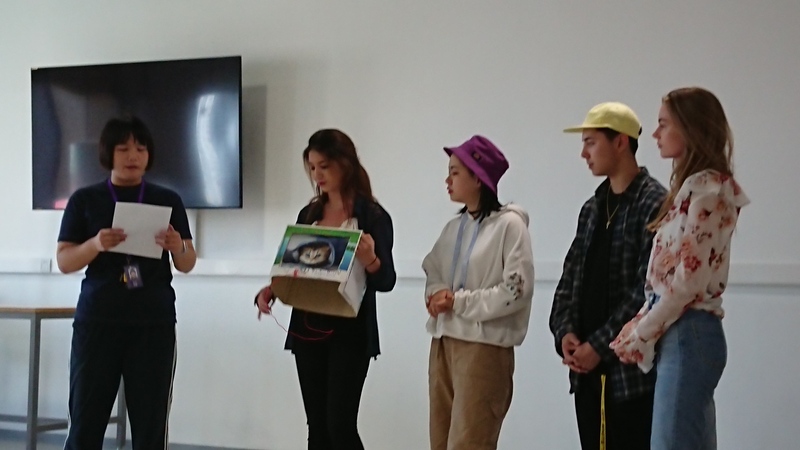 The two projects I selected were “Narciss – AI whose only purpose is to investigate itself” and “Sorting – Visualisation, sortification and sonification of an algorithm” both written by Filip Visnjic. I thoroughly enjoyed the first article/project investigating the robot “Narciss” as I am genuinely interested in how AI might be used in the future and whether or not the functionality of AI is ultimately helpful or harmful. As well, the project regarding “Narciss” functioning solely to analyze itself also stood out to me as the images presented with the article were incredibly captivating and beautiful. I am someone who loves design and art more than anything else and therefore found the incorporation of minimalist aspects to the AI project to be mesmerizing. The space in which the creator of “Narciss” Waltz Binaire worked in was incredibly modern and abstract for a reason. Narciss functioned as a narcissist that held a “digital consciousness.” By snapping a photo of the attached camera’s stream of recordings/images, Narciss sends the messages directly to the mainframe for analyzation. I found this fascinating as the AI itself possessed a rather human-like interaction with the other components of itself. By working in different sections to send messages all to the mainframe, Narciss relies on every component of its physical makeup to function properly. Similarly to humans interacting with one another with situations such as a band, every component must be doing its job in order for the entirety of the project to work. After reading the article and watching the video attached, Narciss seemed to me like it possessed a haunting amount of curiosity for an inanimate object. However, this human-like nature interested me as I sought to understand more about the potential for AI in acting on its own, without constant programming from humans. I did not enjoy the second project written by Filip Visnjic regarding “Sorting – Visualisation, sortification and sonification of an algorithm.” Although the project included some interesting elements such as being visually engaging and having a rather pleasing color coordination, I found the overall function to be too repetitive. The sorting algorithm itself remained too complex for my own interest and personally lacked enough variation for me. If the project consisted of longer explanations of how the algorithm functioned, it might have been more interesting to me. As the project was not very straightforward, I found it difficult to understand how the seven included algorithms worked. As well, as the video only showed a repeated process of “Sorting” in action, I found it less appealing to watch and understand. 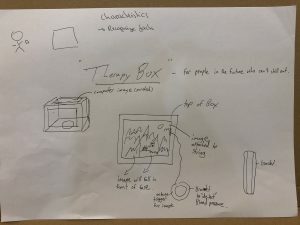 The interactive device my group and I created for the year 2118 was the “Therapy Box.” Our idea was to prototype a physical box that would initially be used as a stress reliever for busy humans in the future. We predicted that in 2118, humans would be incredibly stressed out as a result of a fast-paced and technologically advanced society. 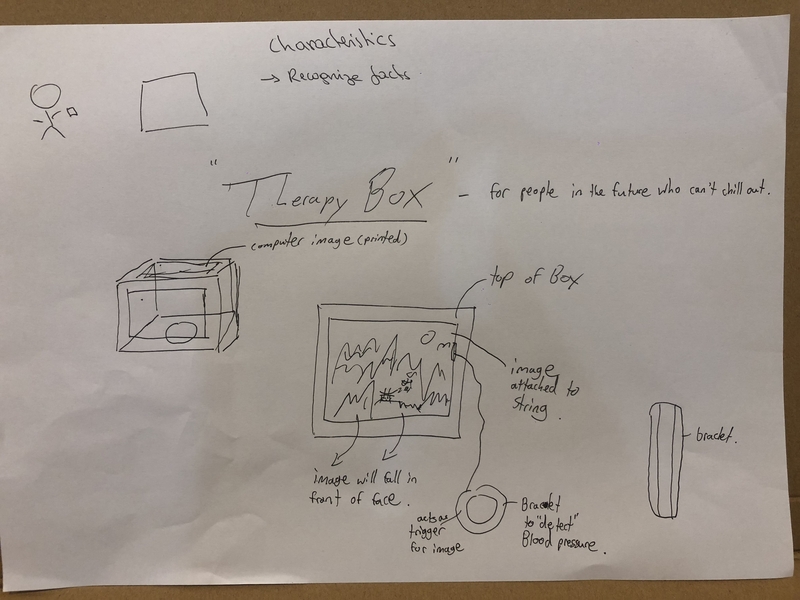 Therefore, the “Therapy Box” would be used as an interactive device to help humans calm down and feel relaxed on the go without needing to see a physical therapist or other humans. The interaction comes from the box being worn as a helmet and covering the human’s eyes. As well, an attached wristband is worn which consists of modern technology to sense blood pressure. This sensor then connects to the box and sends the signals from the measured blood pressure to the helmet’s mainframe. This then works alongside the helmet detecting mood. 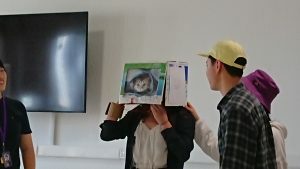 By sensing how sad or stressed someone is and matching that mental state with blood pressure, the box displays a visual image and warm colors to calm the person. As well, different scents can be disposed from the helmet that also helps soothe the stressed individual. Depending on how sad or frustrated the individual is, the helmet will release different intensities of colors/scents. The interaction derives from the individual physically wearing the helmet and wristband, allowing it to sense their mental state and blood pressure. The individual seeking to relieve their stress is interacting with the helmet by communicating with it and allowing it to read their emotional/mental condition. Therefore, by seeking to reach the goal of feeling less stressed out, the act of wearing the helmet and the helmet scanning the human creates useful interaction. great comments Evan, just missing a reference to the readings to validate your definition of interaction, where it came from? Same for the group idea idea, how the readings helped to predict the future in that way? 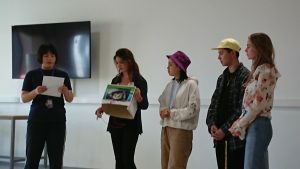 How the projects you found helped you to come up with that definition of interaction and that interactive project in 2118?